Britain's Prince Harry and Meghan Markle arrive for the queen's Christmas lunch at Buckingham Palace, London, Wednesday, Dec. 20, 2017. 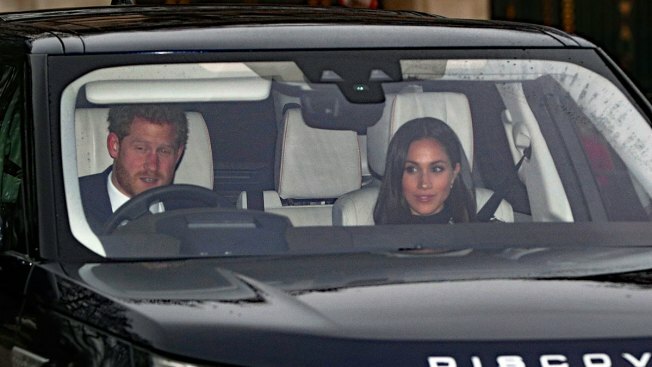 Actress Meghan Markle has joined her fiance Prince Harry to attend the royal family's pre-Christmas luncheon at Buckingham Palace. Queen Elizabeth II traditionally hosts a festive lunch for the family before leaving for her private Sandringham Estate in the Norfolk countryside, about 110 miles (175 kilometers) north of London, where she spends her holidays. Press photos show Harry's car arriving at the palace Wednesday afternoon for the event. Harry, 33, was driving, with 36-year-old Markle in the passenger seat by his side. Prince William and Duchess Catherine were also photographed driving up to the palace with their children, Prince George and Princess Charlotte. The queen's son, Prince Charles, always joined the family with his wife, Duchess Camilla. Also in attendance: Elizabeth's granddaughters Princess Eugenie and Princess Beatrice, and cousins Prince Michael of Kent, Princess Alexandra and Prince Edward. 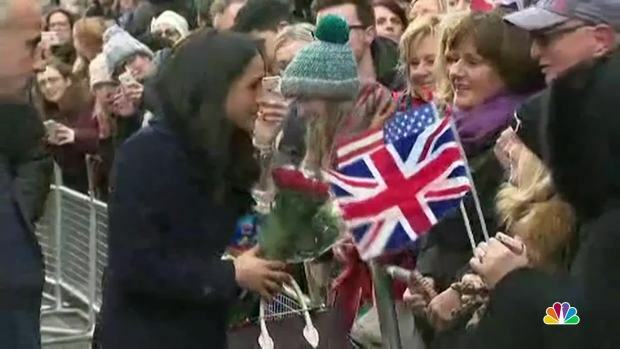 Prince Harry and Meghan Markle greet hundreds of royal fans while traveling to the east Midlands in England to visit a youth project and raise AIDS Awareness during World AIDS day. The Midlands visit kicks off the start to a six month long tour of Britain for the couple. Prince Harry and Markle announced their engagement last month, saying they had met through a mutual friend in 2016. They will be married on May 19 at Windsor Castle's St. George's Chapel in a highly-anticipated royal wedding. Markle broke with royal tradition in attending the queen's Christmas celebration. Prince William's wife, Duchess Catherine, spent the holidays only with William before the two married in April 2011. Markle is also expected to spend Christmas with the royal family at Sandringham, a Palace spokesperson confirmed.